I make capsicum recipes very rarely at home as Sendhil and Raksha is not a big fan of it. But I love to try varieties of capsicum recipes and share in my blog. So once in a while my family members say yes for side dish with capsicum. I have already tried and shared green capsicum chutney for idli, dosa and tomato capsicum masala for chapathi. After trying those recipes, I had a craving to try capsicum kurma as side dish for roti. So last week I tried this kurma for the first time following Yummy tummy Aarthi’s recipe. 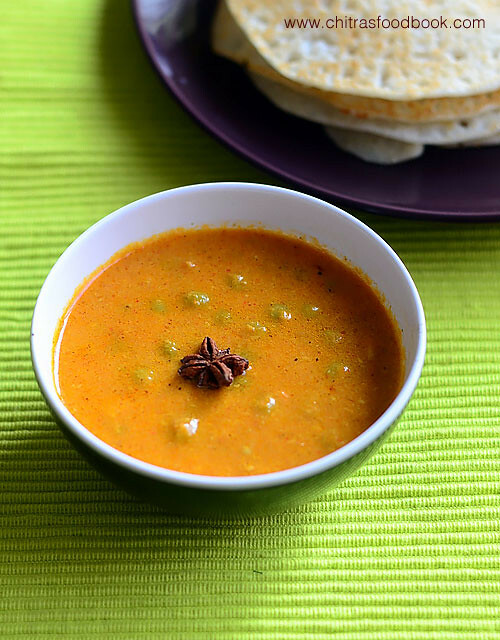 Usually South Indian kurma has a coconut base whereas North Indian korma is prepared with tomato onion base. But this capsicum kurma is prepared with peanut, onion and tomato masala which made me try this recipe. As expected it tasted different from the usual South Indian kurma. Its taste reminded Hyderabadi mirchi ka salan to me. Sendhil and myself liked it very much with chapati. I made slight changes and deviations from the original recipe based on my convenience. I used green capsicum alone as I don’t buy red or yellow capsicum often. With a nice flavor of capsicum, it tasted great. I personally liked it with dosa too. 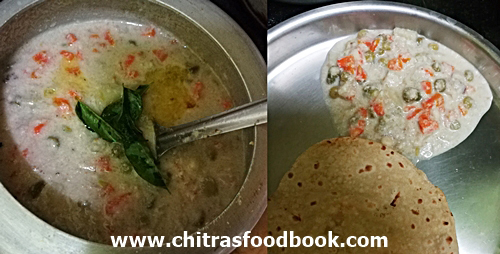 Friends, do try this easy, yummy capsicum kurma recipe for roti and share your feedback. 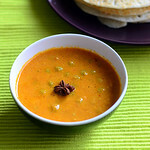 Ok, Lets see how to make capsicum korma with step by step pictures. Heat oil or butter in a kadai. Roast peanuts till its skin cracks. Add onion, ginger, garlic and saute till transparent. Add tomato and saute till pulpy. Cool down and grind to a smooth paste. Heat butter in a kadai. Splutter cumin. Saute capsicum cubes. Add the ground masala paste,spice powders, salt and sugar. Saute till raw smell goes off. Add the required water. Boil for 5 minutes till nice aroma emits.Switch off the flame. Add some lemon juice. 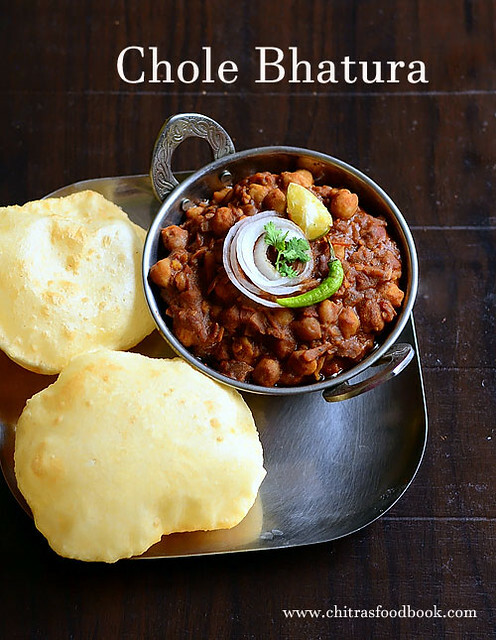 Garnish with coriander leaves and serve hot with chapathi / roti. Heat oil in a kadai. Roast peanuts till its skin crackles. Then add onion, ginger, garlic and saute till onion becomes transparent. Add tomato pieces and saute till tomato becomes pulpy. Switch off the flame and cool down. Grind the mixture to a smooth paste. Set aside. Heat oil or butter in a kadai. Splutter cumin seeds and saute capsicum pieces. 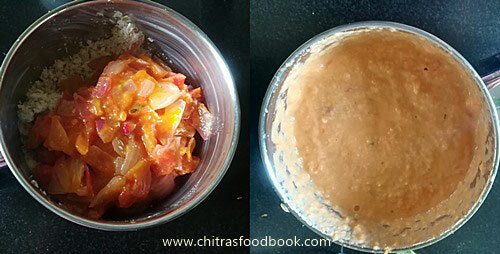 Remove the capsicum pieces in a bowl if you want it crunchy to eat else add the tomato masala paste and proceed. After adding the ground masala paste., add the red chilli powder, coriander seeds powder, garam masala powder, salt and sugar. Mix well till raw smell goes off. Add the required water to bring the gravy consistency. Boil for few minutes till oil starts to float on top. Lastly add the chopped capsicum pieces if you reserved it. Mix well and switch off the flame. Add few drops of lemon juice, garnish with coriander leaves. 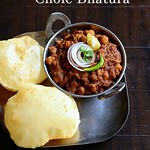 Serve hot with chapathi / Roti. Adjust the quantity of spice powders as per your liking. As per the original recipe, you can grind the raw tomato to a puree. Add to the onion masala and saute well. But I sauteed the tomato along with onion. For crunchy capsicum taste, you can remove it after sauting and add at the end. But I cooked up everything together to make the capsicum soft. 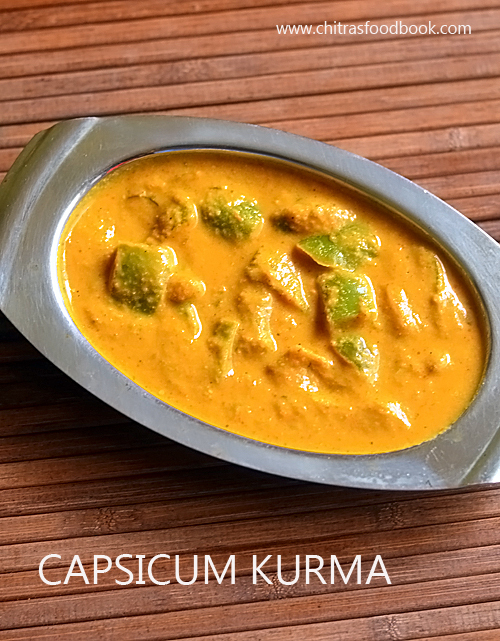 Try this yummy, different capsicum kurma and enjoy with chapathi / roti ! Cauliflower is in season now. Last week I bought 2 flowers and tried some new recipes with it. I prepared this South Indian, Tamil nadu style Cauliflower kuzhambu for rice, idli and chapathi for the first time watching a video in YouTube. It came out very well. 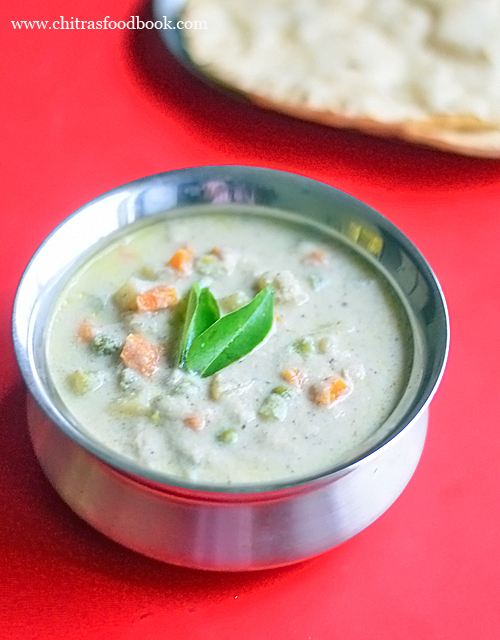 Its a kurma kind of gravy that suits well for rice, idli and chapathi. 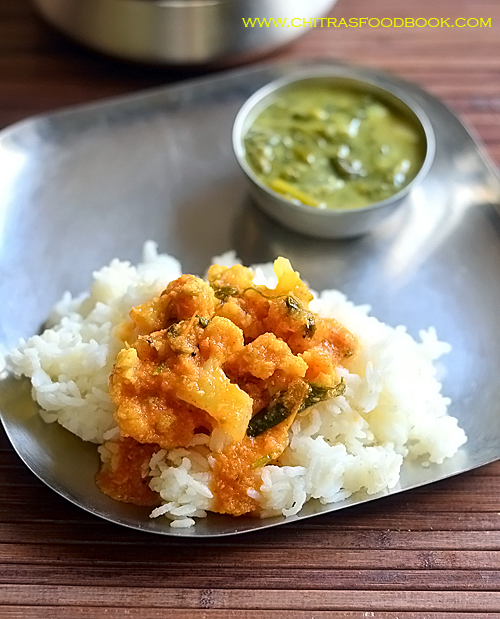 My mom makes a similar cauliflower kulambu adding green peas. 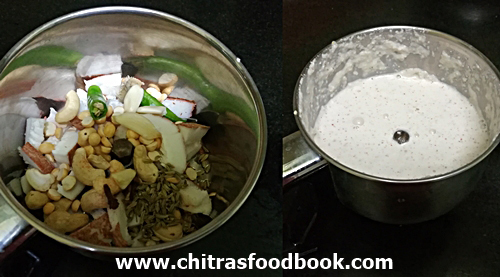 Though the ingredients are the same, this kuzhambu tasted completely different. 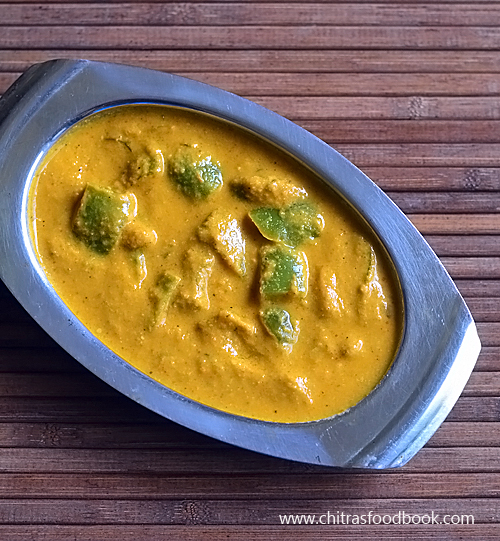 Tamarind is not used in this recipe instead onion, tomato and coconut masala forms the base. I am sure I will make it very often in my kitchen. 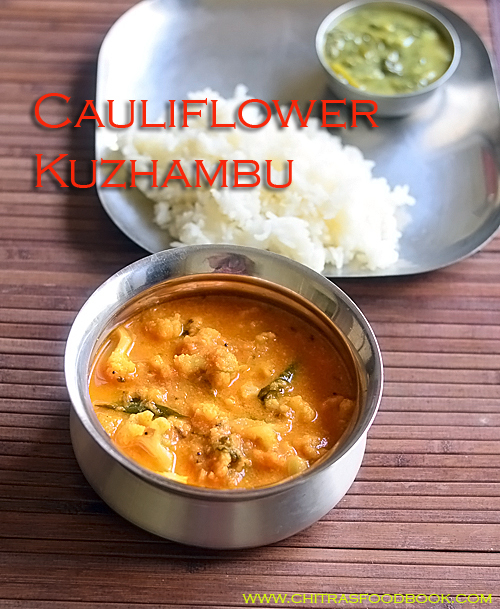 Lets see how to make cauliflower kuzhambu recipe with step by step pictures. Wash and boil cauliflower florets in 3 cups of water adding turmeric powder. Heat 1 tbsp oil in a kadai.Saute onion, gg paste and tomato. Take a mixie jar. Add grated coconut, fennel seeds, red chilli powder, garam masala powder and turmeric powder. Grind to smooth paste adding required water. Heat 1 tbsp oil, temper and add the ground paste. Add the cauliflower florets. Boil the gravy adding 1 cup of water, required salt. Simmer for 10 minutes till its raw smell goes off. 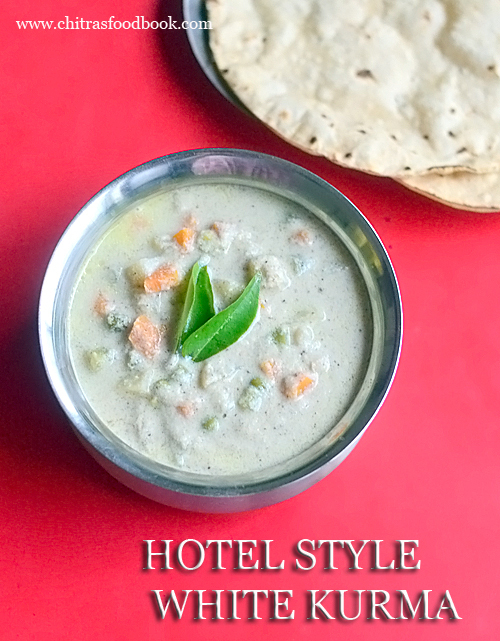 Garnish with coriander leaves and serve hot with rice, idli, dosa and roti. Wash the cauliflower florets. Boil 3 cups of water adding turmeric powder,little salt. Add cauliflower to hot water & parboil for 5 minutes. Drain the excess water & set aside. Heat 1 tbsp oil in a kadai.Saute onion, ginger garlic paste till onion turns transparent. Now add tomato and saute till mushy. Grind to a smooth paste adding coconut, fennel seeds, turmeric powder, red chilli powder, garam masala powder and salt.Add required water to make a smooth paste. Heat oil in a kadai. Temper mustard seeds, curry leaves. After it splutters, add the ground paste. Add 1.5 cups of water and parboiled cauliflower pieces. Mix well and check for taste. Add more salt or chilli powder if needed. Keep the flame medium and let the gravy boil till nice masala smell wafts through your house. Check for thickness. If its too thick, add some water and bring to desired consistency. Garnish with coriander leaves and serve hot with plain rice. Enjoy ! Adjust the quantity of red chilli powder and garam masala powder as per your taste. You can also use boiled potato instead of cauliflower. 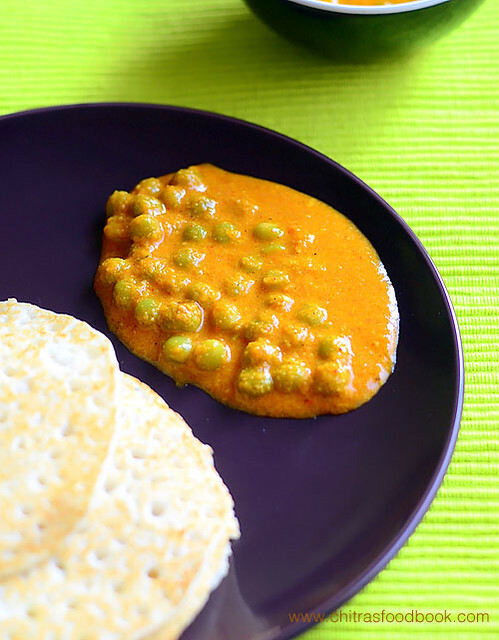 If you like, you can add boiled green peas along with cauliflower. Make it slightly thin if you are serving for rice, idli or dosa. 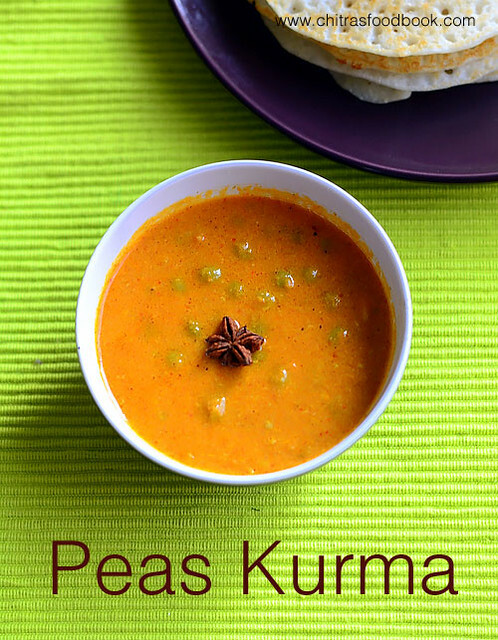 If you want to serve for roti/chapathi, boil the gravy till semi thick and serve as kurma. 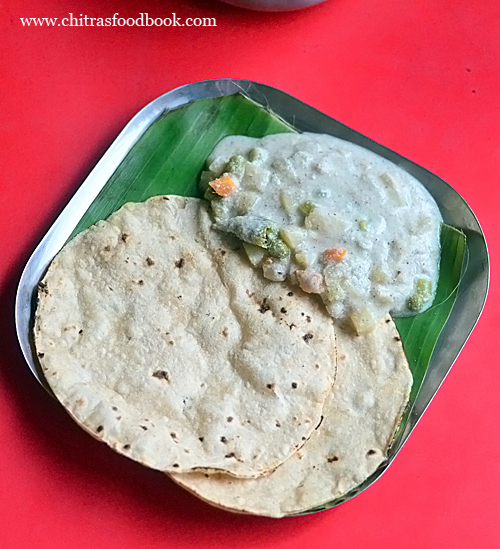 Try this easy, yummy cauliflower gravy for rice, idli and roti. Enjoy ! This is an easy Kondakadalai puli kuzhambu recipe without coconut / Brown chana gravy for rice in my MIL’s method. Some people also call this as Sundal kulambu. But we call it as karuppu kondakadalai vatha kuzhambu. 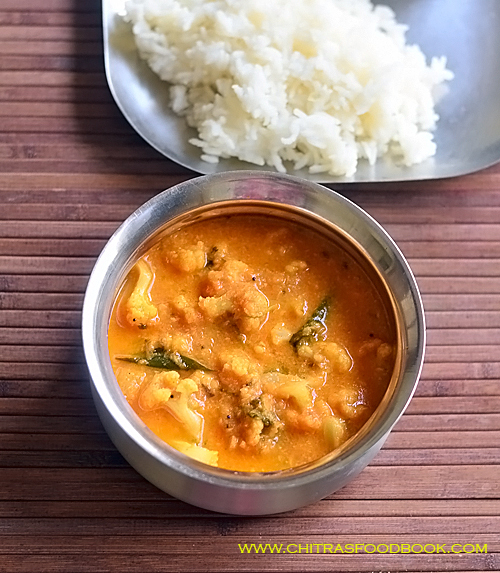 This kuzhambu can be prepared easily without grinding any masala or coconut. So bachelors, working women and even housewives can complete their cooking very quickly during busy morning hours. 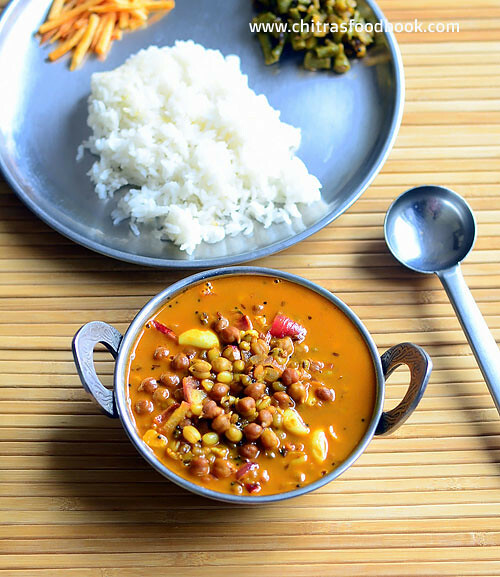 We make this brown chana kulambu at least once in a month to include pulses in our daily diet. Sometime my MIL adds brinjal/kathirikai or drumstick/murungakai in addition to brown chana. Recently I made this gravy with little soaked green gram. It came out very well and tasty. I have shared nearly 40+ kuzhambu recipes in my website but I haven’t posted any kuzhambu varieties adding pulses like kondakadalai/ chickpeas, lobia/karamani, green gram/pacha payaru, dried peas/pattani etc. 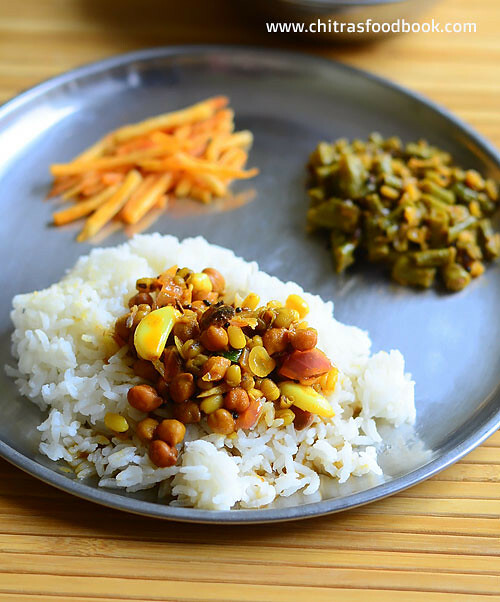 Recently a reader asked me to share these type of kuzhambu varieties as they get a satisfaction of eating pulses during lunch instead of making them as sundal. Yes, its true. Even I love to consume pulses either for breakfast or lunch as it takes more time to digest and keeps the tummy full for long time. Lets see how to make kondakadalai kuzhambu with step by step pictures ! Check out my poondu kuzhambu, sundakkai vatha kuzhambu and no onion no garlic manathakkali vatha kuzhambu too. 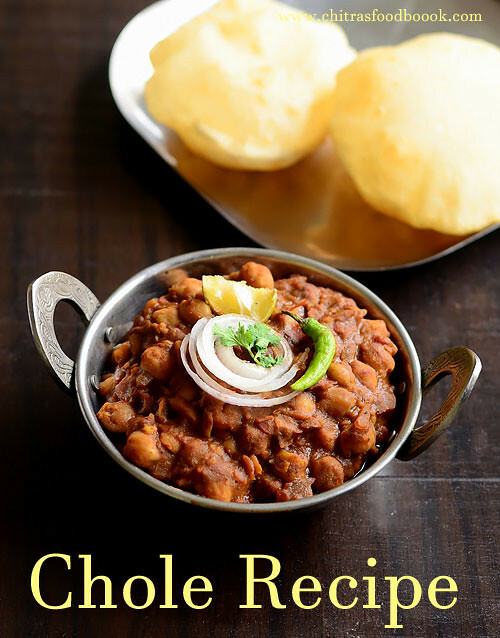 Wash and soak brown chana/kondakadalai overnight or for 8 hours. Heat oil and temper. Saute onion, garlic and curry leaves. Add the tamarind extract, sambar powder, turmeric powder and salt. Add cooked channa and boil the gravy till raw smell goes off. Add little jaggery while it boils. Optionally you can add 1 tsp rice flour diluted in 1/4 cup water. Add to kuzhambu. Boil till thick and then remove. Serve hot with rice ! Wash and soak brown chana overnight or 8 hours in enough water. Drain the water and add to pressure cooker. Cook in very low flame for 2 whistles adding required water and salt. ( I had some soaked green gram.So I added it along with chana). Soak tamarind in 2 cups of water and keep aside. Wash and chop onion finely. Chop 5 garlic cloves and keep the remaining as whole garlic cloves. Chop curry leaves finely. Keep aside. Heat oil in a kadai. Splutter mustard seeds, urad dal, fenugreek seeds, cumin seeds, toor dal and saute for a minute in medium flame. Add finely chopped onion, garlic, curry leaves and whole garlic cloves. Saute till onion turns transparent, garlic turns light golden in color and leaves a nice aroma. Take 2 cups of tamarind extract and add to the kuzhambu.This kuzhambu has to be slightly watery than the usual vatha kuzhambu because chana will absorb all the water and gravy becomes less in quantity. So its advised to make more in quantity. Add sambar powder, turmeric powder,jaggery and salt. Check for taste and add more sambar powder if needed. 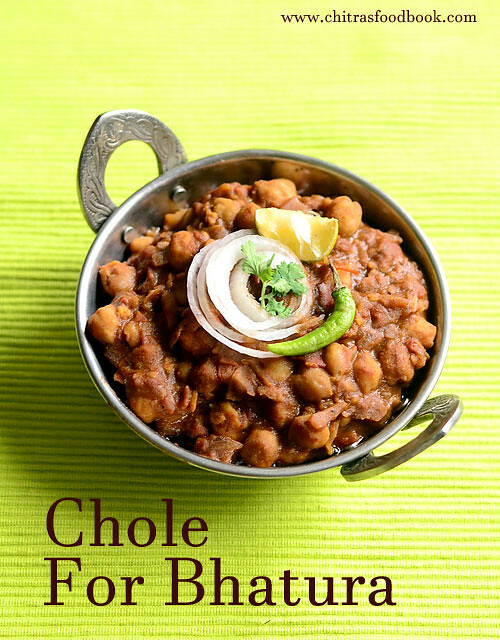 Drain cooked brown chana. Mix well and boil for 5 minutes till raw smell goes off. Add more water if needed. Take 1 tsp of rice flour, add 1/4 cup water and dilute it without lumps. Add to the kuzhambu while it boils. Roll boil for few minutes till slightly thick. Switch off the flame. 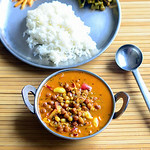 Serve with rice and kootu / poriyal. 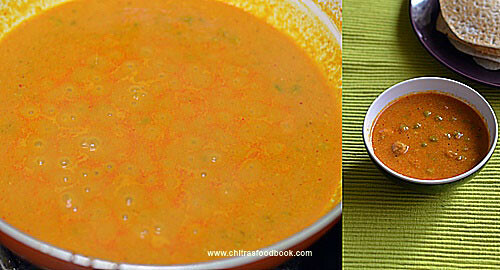 Adjust the quantity of sambar powder as per the taste. You can also use kuzhambu milagai thool. You should make more gravy else chana will absorb the gravy as time proceeds and you won’t get enough quantity to serve. For variations, you can add 2 tbsp of ground coconut paste. 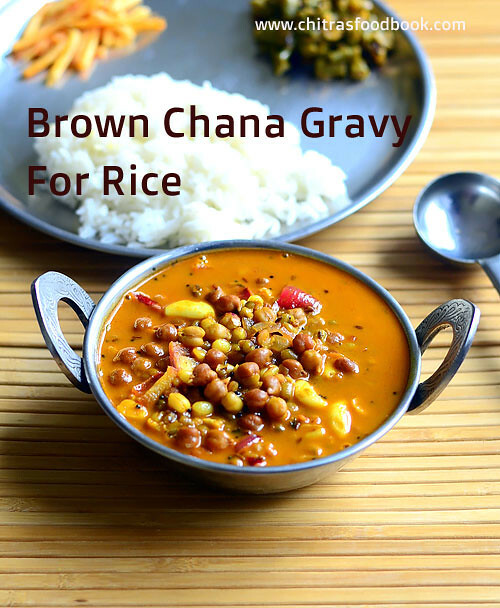 Try this yummy brown chana kuzhambu for rice and enjoy with kootu/poriyal and papad !